Now that I’ve lived in Portland, Oregon more than a decade, I’ve learned to take a few things for granted, found routines, formed habits, and so forth. But I feel like–no matter how long I live here–I’ll never lose the sense of excitement I get when Deschutes Brewery releases Jubelale each September. I don’t remember the first time I tasted it. I don’t remember who introduced me to it. I do know I prefer it (like many beers I enjoy) on tap. It’s a solid strong ale, a 25-year-old stalwart and an award-winner that has undoubtedly helped establish Deschutes as an international craft brew leader. But to me, Jubelale is a transcendent microbrew. Hear me out. The calendar marks days, weeks, months, moons, seasons, solstices and equinoxes. 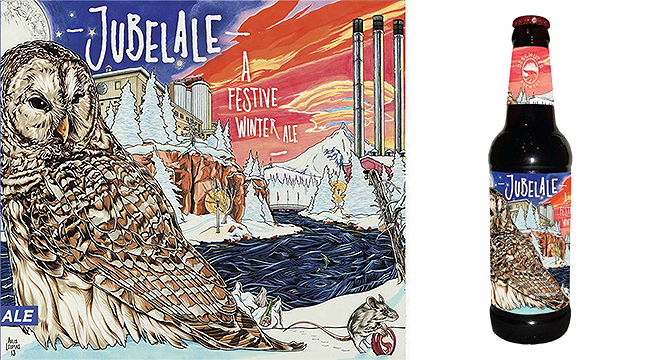 Jubelale’s release every September marks time for me–transcending brewery production schedules, monthly sales figures and the day-to-day mundanity of life–to call my attention to the changing season at hand. It’s more than just a seasonal or a “festive winter ale” as Deschutes labels it. It’s a harbinger. A portent. And it tastes great. Here in the land of big, hoppy IPAs, Jubelale’s malty, well-balanced flavor is a beer lover’s way to relax. It’s like a deep breath, an acknowledgment of the dimming of the light that shorter days are bringing, a recognition that summer has passed. It’s a lovely garnet color and, at 6.7% ABV, not at all overwhelming. Maybe those IPAs we love so much here in Portland are an extension of our celebration of the sun, of the precious summer months we earn by sometimes enduring long, rainy, dreary months. (The same way sailors on 17th-century trade routes required a hoppy beverage that would endure the long sea voyage.) I’ll never decline a well-built IPA, but Jubelale helps me transition, find comfort in the changing seasons and celebrate the friends and fortune that make life such a gift.